Why study ocean currents from space ? Because ocean currents play many roles ! 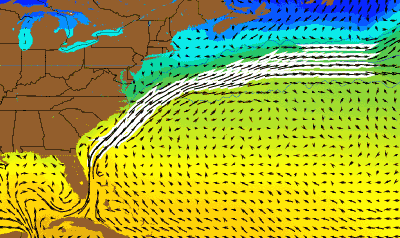 They cool the tropics and warm high latitudes. They influence rainfall patterns around the world, sometimes creating droughts or floods. They create fertile fishing grounds in one area, ocean deserts in another. They transport ships but can also send pollutants released by one country to the beaches of a neighbour. Currents in the oceans measured from space ! 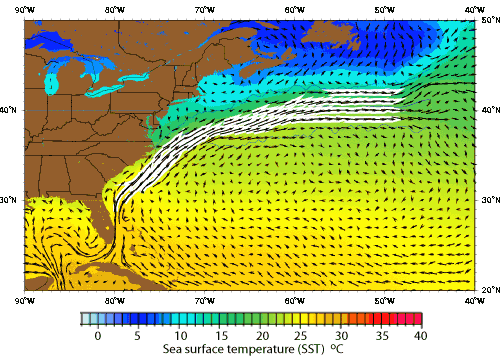 Gulf stream temperature and current velocity. Source: CIMAS.